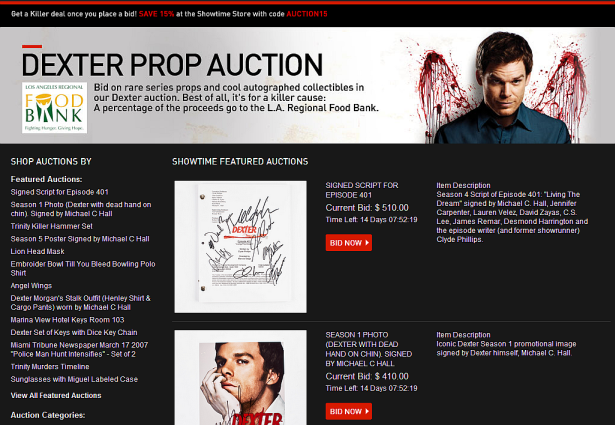 Showtime launches the Dexter Prop Auction. Bid on rare series props and cool autographed collectibles. (Signed Script for Episode 4.01, Season 1 Photo (Dexter with dead hand on chin), Signed by Michael C Hall, Trinity Killer Hammer Set, Season 5 Poster Signed by Michael C Hall, Lion Head Mask, Embroider Bowl Till You Bleed Bowling Polo Shirt and more). And it's for killer cause. A percentage of the proceeds go to the L.A. Regional Food Bank. Visit the page. i really want the kill outfit. like bad. The proceeds are going towards saving lives, while Dexter is using his bone saw to dismember his victims.